During their first year in existence, the Appalachian Faith and Ecology Center (AFEC) connected many people of faith to the current issues impacting the ecological integrity of Central Appalachia. The volunteer staff, Jackie Hanrahan and Susan Hedge, set up their office and then headed out into the community to share their passion. Susan Hedge visited congregations in Florida and assisted with three seasonal rituals in Virginia as part of AFEC's goal of helping churches spiritually connect to the natural environment. 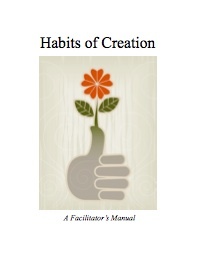 Although AFEC's staff can't visit every church in the nation, they have teamed up with the Catholic Diocese of Richmond to make a facilitator's manual --- Habits of Creation --- available for download as a pdf document from AFEC's website. 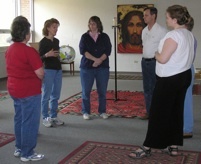 Greening churches is another focus of AFEC's endeavors. The staff works with churches to assess their environmental impact and then consider green changes like brown bag lunches and rain gardens. AFEC's guide to greening church picnics will be up on their website by the end of the year. 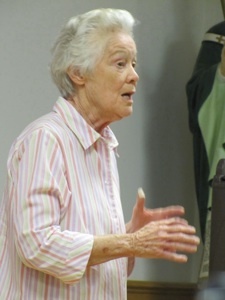 When asked what's next, Susan Hedge explained that she plans to develop AFEC's first web-based educational program on environmental justice in 2011. Jackie Hanrahan is hard at work planning liturgical celebrations and conference presentations. AFEC has been grateful for the help of the Clinch River Educational Center who served as their fiscal agent in 2010 and will continue to do so in 2011, but the organization plans to eventually stretch its wings and grow into a fully self-sufficient group.